we were tired that night. so tired. we'd been on the road for a week, spent the larger part of the day driving the streets of palm springs. the children were through with architecture, done with adult conversations about color and mid-century motels. and so we were on our way back to the motel, back to the swimming pool and the serious, serious business of cheap pizza and cable television. the light turned to gold just then, real actual liquid gold and just five short blocks from the motel 6, we remembered. the windmills. it should be noted the children did not put up much of a fight. quart-sized slushees had been consumed, extreme heat experienced, no one had much fight left, not really. one week on the road and it was still anyone's game. the day was still a fairly malleable thing. windmills, we said. yes, we said. ten minutes later, we found ourselves out on the edge of town, parked as close to the windmills as we could manage. and we stood, in what can only be defined as a sort of desert wasteland, sandwiched between a stretch of highway and a chunk of train track, canyons to the right of us, windmills to the left, a sea of windmills, an endless, impossible chorus. below us, a desert floor so littered with trash we could not help but look down. palm tree pieces, glittery glassy bits, flattened cans from decades past. a toilet, a few tires, a flannel shirt, an old brocade couch. the deeper we wandered, the stranger the items. the stranger the items, the more excited we became. I'll tell you, the children were excited about the trash. you know what? so were the adults. collections were started, possibilities discussed. could we fit that ginormous tree branch aka wizard staff in the car? surely that palm tree chunk would make an excellent planter. hey, were those ray ban glasses? because we should not leave without those ray ban glasses. I don't know how long we went on like this. hours, it seemed. the wind picked up just then, the last of the honeyed light fell over ava and I shot what would be my most treasured photograph of the year. 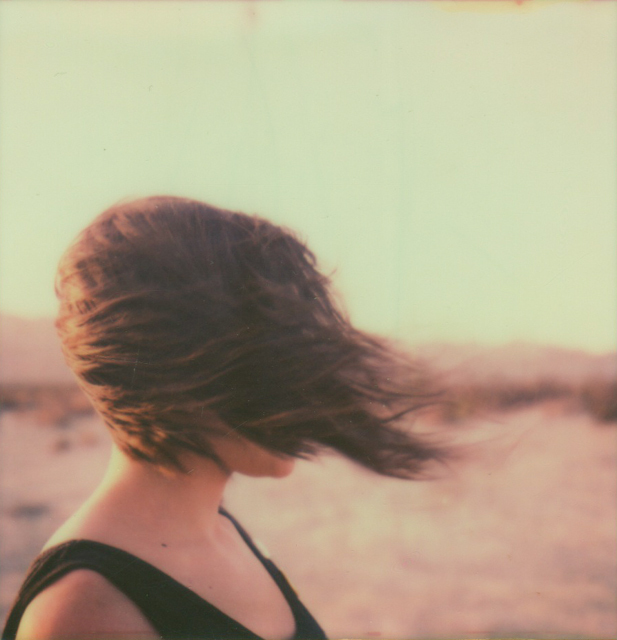 as if on cue, the train roared past and the wind from it snatched that polaroid right out of my hands. we ran for it, all four of us, scrambled like crazy people to catch it before it completely disappeared. the same wind whipped hair into my eyes, sand into my mouth, picked up the edges of my skirt, flipped it over my head again and again. I should have been miserable, I should have been frantic, I was anything but. laughing, half-running, half-stumbling in the direction of the polaroid and what was this strange, beautiful place we were lost in anyway? how did we end up here? how had it managed to completely charm us? this. my most treasured moment of twenty fourteen, my most treasured photograph. 2014 holds a hundred different stories, a thousand different images but, this. the best of the best because I look at it and I remember and I think, yes. we said yes. in twenty fourteen, we said yes. when it was difficult to say yes, when we weren't sure about yes, when we were tired and didn't think we'd make it, we said yes. and it certainly hasn't been a walk in the park (it never is) but the good stuff happened because we said yes. I don't know about twenty fifteen, I don't know how I feel about it yet. there's bound to be some yes in there somewhere, though. I don't know about you but I'm rooting for the yes, for the running and the stumbling and the laughing, for unexpected desert wastelands and more honeyed light than I know what do with. the beautiful way you see the world amazes me always. This one. This is what a recollection of a year should be. So much yes. This is the most beautiful thing I have ever read. Ever. Oh, what a wonderful way to describe the experience. It reminded me of one of my own, chasing a map blown by the wind in strange desert country. We finally had to just let the map go. Good writing tends to move like beautiful music across the page. This was one of the best songs I've ever heard. Thank you for this gift. so beautiful. evocative and essential at the same time. happy twenty fifteen. Gosh... you are such a beautiful soul. Much love to you + yours. This is a beautiful glimpse into the story behind a most gorgeous photo.